Rhee Sang-Woo, b. 1938, Ph.D. in Political Science, University of Hawaii, 1971; Associate Director, DON Project, 1971–73; Professor of Political Science, Kyung Hee University and Sogang University, 1973–2003; President of Korean Association of International Studies, 1991; Chairman of Presidential Commission of the 21st Century, 1987–94; President, Hallym University, 2003–07; and President, New Asia Research Institute (NARI), 1993–present; Email: swrhee38@gmail.com. A Great Teacher himself should be a ‘perfect intellectual,’ since he is supposed to train mature intellectual leaders of the community. A Great Teacher should be a man of integrity who inspires others through his words and deeds. A Great Teacher should be a role model for his disciples. Rudy Rummel devoted his whole life to the study of war and conflict. Enhancing peace had been his life-long academic goal. Throughout his whole academic career, he concentrated his teaching and research on peace studies. Based on empirical analysis of various cases of democide, the mass murder of citizens by their own government, he concluded that psychopathic totalitarian ideologies such as Nazism, Leninism, Maoism, and Japanese militarism are the real enemies of peace. From these studies, he derived a simple but very strong thesis: ‘freedom fosters peace’. His libertarian peace theory was developed in support of this belief. His magnum opus, Understanding Conflict and War is the main output of his endeavor. Rummel then launched a vigorous public campaign to spread his message. He wrote a series of novels, Never Again, as well as The Blue Book of Freedom to propagate his belief to the men on the street. His students were moved not only by his academic sincerity but also by his deeds. Rummel was a real Great Teacher who led his students to try to emulate his life style. A Great Teacher should also be a good scholar and maintain academic prominence. To maintain his academic excellence, Rummel educated himself constantly in order to continue as a positive role model. He read enthusiastically until the day he drew his last breath. He read widely, even exploring books written by ancient Chinese sages as well as Western classics. Based on his readings of works by Chinese scholars such as Confucius and Mencius, he held intensive discussion sessions on neo-confucian political doctrines with his Korean students. Aside from his own field of political science, his reading covered a wide range of areas from mathematics, philosophy, and aesthetics to psychology and sociology. Understanding Conflict and War elegantly demonstrates the breadth of his knowledge. He wrote a total of twenty books, and it is difficult to believe they were written by a single person. With his guidance and advice a new generation of students were groomed into mature scholars. During Rummel’s tenure at the University of Hawaii, for ten years, the East-West Center annually brought in two Korean students for graduate training. Among these students, more than half chose Rummel as their academic advisor. They felt intellectually comfortable with Rummel and were attracted by his Weltanschauung that was congenial with oriental academic thinking. Traditional Oriental philosophy is based on the belief that the Universe evolves following its own laws of change. We call it Heavenly Reason (tien-li). Since human beings are partial elements of the Universe, they should abide inter-personal ethical codes (ren-tao) derived from the tien-li. Political doctrines for communal governance (chi-tao) then should reflect the ren-tao. Rummel’s firm belief in ‘Man in Nature’ contrasts with the prevailing Western assumption of ‘Man versus Nature’ and was easily accepted by his Korean students. According to the standard thinking in the oriental culture, a man’s identity is determined by his combined relations with other people and things. Inter-personal relation is not the calculated distance between men. Rather, the relations determine the identity of the man. These ways of thinking fit with Rummel’s concept of ‘field’. ‘A nation’s attribute distances from other nations in A-space will determine its behavioral pattern in B-space’. This is the core argument in Rummels Field Theory, and one that his Korean students could easily accept. These shared perspectives led Rummel’s Korean disciples to accept his theoretical arguments easily. Professor Rummel started his teaching career at Indiana University and then taught at Yale University for two years. In 1966 he moved to University of Hawaii, where he taught for 30 years until he chose early retirement in 1995. During his tenure at University of Hawaii he served as the academic advisor for twelve Korean Ph.D. students, more than half of the total number of Ph.D. candidates he advised. Of the twelve Korean students, six wrote their dissertations under Rummel’s guidance. Most of them returned to Korea and assumed professorship in various Korean universities and actively promoted Rummel’s work to their colleagues and students. In the Korean academic community they were known as the ‘Rummel School.’ They introduced Rummel’s theories, beliefs, and arguments in their own monographs and textbooks. In addition to their academic activities, Rummel’s Korean disciples also made a major contribution to the Korean government’s foreign policy development. For example, Dr. Chang-yoon Choi, who taught at the Korean Military Academy, was later recruited by President Roh Tae-Woo to serve as Minister of Culture and Information. Dr. Yong-ok Park who greatly contributed to development of Rummel’s Field Theory Model II while he worked as a research assistant for the DON Project, taught at the Korean Defense University and later served as Deputy Minister of National Defense. Dr. Jong-yul Lee, another DON research assistant, was elected to the National Assembly and served President Chun Doo-Hwan as Chief Secretary of Political Affairs and Minister of Political Affairs. Another DON assistant, Sang-Jin Choi, joined the Ministry of Foreign Affairs and later served as Ambassador to Finland. Dr. Young-Sun Song, the youngest Ph.D. student in Rummel’s Korean brigade, worked as chief policy analyst at the Korean Institute of Defense Analyses and was later elected as a Member of the National Assembly. I myself, after thirty-year long teaching career at Sogang University, worked for the ROK government as Chairman of Policy Advisory Committee in the Ministry of Foreign Affairs and Ministry of Unification. I also served as Chairman of the Presidential Commission of the 21st Century and as Chairman of the Military Reform Committee of the Ministry of National Defense. Rummel’s academic achievements are perhaps even better known in Korea than in the United States, since he has been more broadly introduced in Korean academic journals and textbooks than in any other country. His Korean students share his critical thinking, his democratic values, and his political outlook, as well as his attitude toward academic research. Through these Korean students, Rummel’s philosophy and ideology of libertarian peace is widely spread among the Korean intellectuals. It was in 1967 that I first met Professor Rummel at University of Hawaii. I was awarded an East-West Center scholarship sponsored by the US State Department, which enabled me to pursue graduate studies at University of Hawaii. Until I earned my doctorate in 1971, Professor Rummel was my academic advisor. I completed my dissertation, ‘Communist China’s Foreign Behavior: An Application of Field Theory Model II,’ under his guidance. 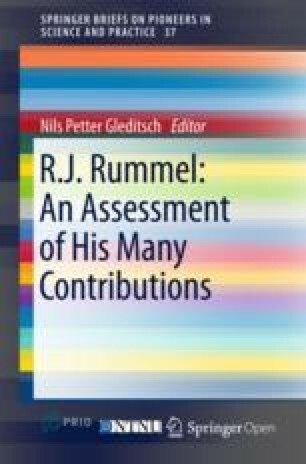 For two years thereafter, from 1971 to 1973, I assisted Rummel in managing the Dimensionality of Nations (DON) Project, as its Associate Director. I was also deeply involved in projects dealing with issues related to conflict and war among nations as well as peace-related theories, which were his core research subjects throughout his academic career. I returned home to Korea in 1973. To disseminate what I learned from Rummel, I I invited Rummel to Korea in 1978 to teach a two-week special summer class for graduate students from universities all over the country. I also arranged for his book In the Minds of Men to be published by Sogang University Press. This book has been used as a textbook by many universities in Korea. Then I translated and published his two books, Democide and The Blue Book of Freedom in Korea. I also collected some of his writings, including his autobiographical account ‘Roots of Faith’ along with some of my own essays in a book. This volume was published in Korean as Rummel’s Libertarian Peace Theory. Unfortunately, my laziness prevented me from doing more to disseminate this work and others that highlight his great achievements—which I still regret today. Since I returned to Korea in 1973, until three years before his death, I went to visit Rummel and Grace in Hawaii at least once a year. Whenever we met, even after I became a retired professor in my mid-seventies, he gave me a ‘special lecture’ on new research trends in political science and kept me abreast of the progress of his own research projects. These lectures easily lasted a few hours. I was clearly his lifelong student. Rummel’s love for all of humanity, transcending ideology, race and social status, were limitless. His students including myself were deeply moved by his love for humanity. While fire is the source of light, so love is the source of peace. Love signifies respect for the dignity of fellow human beings. Only those who enjoy freedom can respect the dignity of others. This led Rummel to conclude that ‘freedom makes and fosters peace’. He had a firm belief in the need for an order of community whereby all human beings could enjoy freedom and happiness regardless of their social status, ‘liberated from the willfulness of others’. He thought peace was an order whereby all human beings could co-exist with mutual respect. This philosophy became deeply imbued into the minds of his students. His determination to contribute to establishing an order of peace launched him on a lifelong academic career devoted to the study of peace, and his students tried to emulate his life. Rummel sincerely listened to all theories and arguments made by others that were put forth, whether or not he agreed to them. Without obstinacy, he listened to what others contended with an open mind. He was perhaps one of the best-read scholars. Listening to diverse opinions, he carefully selected useful ones and accommodated them in his theoretical frame. He always sought to extricate himself from bias, and such an open scholarly attitude moved his students. Rummel was not a pedantic scholar. He was more interested in down-to-earth ‘human life’ than in academic theories. To him, academic research had no significance in itself; it had significance only when it provided the wisdom needed to improve realities or to promote the welfare of humanity. For instance, he searched through historical facts to locate instances of mass murders by dictators (democide) to show the world how such events devastated the lives of ordinary individuals. Most of his later academic efforts were geared toward identifying instances of democide in order to develop a system to prevent it. His series of novels, Never Again, is an outcome of such efforts. Rummel’s positive academic approach deeply influenced his students, who followed in his footsteps and adopted empirical approaches to research. Professor Rummel quietly passed away in the spring of 2014. As dictated in his will, his body was cremated and the ashes were scattered in Kaneohe Bay. Although his body has disappeared, I do believe that his mind will be wandering in space forever. I also believe his love will live on in the minds of his students, for whom he will forever remain a Great Teacher. I often have dreams in which I see Rudy flying in space with a bright smile, holding hands of his wife Grace. I do miss him and Grace.